When Daiga Atvara left her native Latvia more than 18 years ago to head for California, she had few plans beyond making art amidst the giant redwoods of Humboldt County. She had been studying at The Academy of Arts in Riga, Latvia, when she won a scholarship to explore whatever discipline she liked at Humboldt State University. Enamored with the ideas of making things — very big things, as it turns out — Atvara chose sculpture. She spent the year mastering welding, bronze pouring and metal work, producing, among other objects, some gigantic metal birds that she says are probably still out there somewhere in the Humboldt woods. Atvara had no real plans to stay in America, but she soon ended up about as far (in more ways than just physical distance) from the Baltics as it is possible to get. She stayed on the West Coast after the scholarship program ended, but drifted, rather by chance, to sunny San Diego, where she put her design skills to use on early digital advertising work. It was there she met Dan Khabie, whom she worked with at an agency — “the first digital agency here in San Diego,” Atvara says — where she served as creative director. The two hit it off, bonding over the untapped possibilities they saw in digital media. Disappointed with the scope of work they were given the opportunity to pursue, the two soon came to the idea that they should start their own company. Back then, in the late 1990s, online advertising consisted mainly of flat Web pages for brands staking out their dotcom territory. “It was heavily technical,” remembers Atvara. “There was very little attention paid to storytelling and design.” She and Khabie founded Digitaria in 1997 with the intention of changing that. 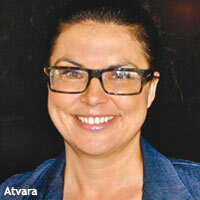 “There was so much opportunity to do it better and in ways that had never been done before,” Atvara says. And while Digitaria, which was acquired by wpp’s jwt in 2010, is no longer strictly a West Coast firm, its heart still beats in SoCal. The Digitaria hq in San Diego is in a peach of a location just past the outfield wall of Petco Park, the home of the Padres, perched high over the stadium. Employees gather on the terrace to take in games sometimes, but Atvara says she hasn’t developed a taste for the national pastime, though she’s tried. “I did my best,” she says. “I’m still trying. I think it’s beautiful to watch it, because it looks really complicated.” She wishes, she says, that she could love baseball, but for now she’s just pleased that others in the office are enjoying it. Those people are, after all, fundamentally why Digitaria exists. “We live in such a commercialized world, it’s easy to lose track of what we’re really doing,” says Atvara, and to keep this in mind, Digitaria is committed to putting the knowledge it’s gleaned and the insights it’s learned toward two large-scale nonprofits a year, such as Invisible Children, for whom Digitaria built an entire platform to track and build awareness of the toll of war on children in Uganda. “If you can use that knowledge to stop a war or catch a bad guy, there can be no better feeling than that,” she says. No matter what the work might be — metal birds, digital agencies, platforms for clients — Atvara is driven to build things. Big things. And design is integral, not just the pretty veneer. “Design is ultimately usable,” she says.